I am SO excited to be heading to Electric Picnic again this year, it will be fourth year in a row! In the lead up to EP, I thought I would do 5 part series on festivals using the hashtag #FestivalFun. Some general tips and hints. Whether you're an old timer or it's your first festival, it's never any harm to pick up some extra ideas on how to get the most out of your time! So there'll be one post each day from Wednesday to Sunday! Ok to start the series off, I thought it would be most practical to start with the essentials to bring along to a festival. To make this digestible, I will break it down by section. Ensure you have adequate camping gear, at a minimum a tent and a sleeping bag. Now over the years I have seen people bring pillows and duvets, etc. My tip here is make use of bags/clothes when it comes to needing a pillow, trust me the less you need to haul from the car the better. I always try to bring everything in one trip from the car, the more trips you, the more you miss out on the festival itself. Also I'd take tent sizings rather loosely, if there's 2 people you're going to realistically want a 4 man tent unless you want to feel claustrophobic. 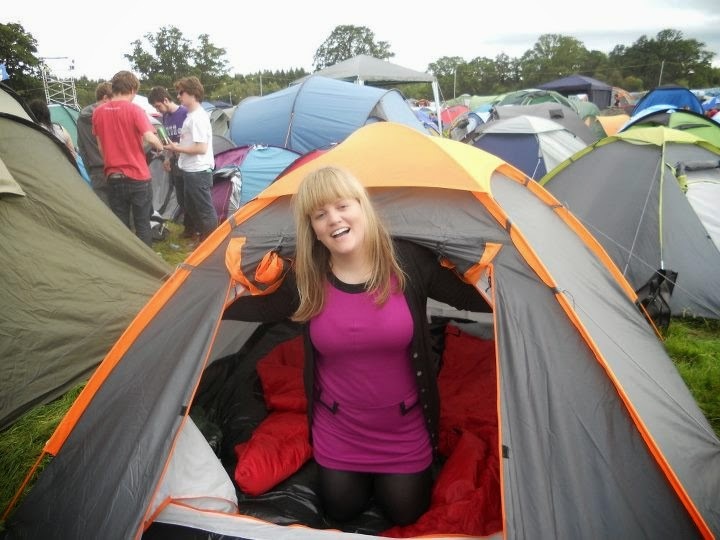 This is me at EP 2010 in what is classed as a 4 man tent, but comfortably fits two with all your belongings I reckon! Then depending on your own preferences you can choose to bring deck chairs or inflatable mattresses, etc. But beware, this definitely adds a large amount of bulk to your already full hands when trekking from the car to the campsite. Depending where you're parked and where you're set up, the trip could be 30-40 minutes one way! I know festivals have their own dress code now and you might feel a little under pressure to dress a certain way, but trust me while on paper this all sounds great, the reality is often something very different. I cannot stress this enough, comfort, comfort comfort! You are sleeping on the ground, in desperate need of a proper shower and a decent toilet, don't add to the misery by feeling awkward in what you're wearing. If festival chic is your usual get-up, then great! If it isn't, don't force it. You will honestly find all sorts of people wearing all sorts of clothes, trust me, whatever you wear, you'll fit in fine! - Does it transition well from warm day time, to cold night time? On top of whatever outfits you decide on make sure to include a rain coat and some cosy hoodies. It's amazing if you get great weather for the weekend, but do not underestimate just how cold it can get in the evenings and at night! Although they're a cardinal beauty sin, this is the one occasion where everyone agrees face wipes are handy to have on hand. Another absolute must is hand sanitiser, I don't think that needs much explaining. Then think travel bag on everything else, decant a small bit of your cleanser, moisturiser, etc. Again the less you have to carry the better. This is definitely not the time to break out the face masks and body scrubs. Whatever the absolute minimum your skin can live on for 3 days is all you're bringing. That will differ for everyone, but once you have something to remove your makeup and something to put the mositure back in afterwards, you should be able to survive! If you're at a festival for a full three days and need to make use of the showers, a mini shower gel is also essential. Keep it basic, bring only the bare necessities. Bring your tried and tested products and make life easy on yourself by only bringing one of any given item. There is definitely no need for two types of mascara. And unless you're a pro at applying a full face of make up in a few minutes, I would definitely recommend scaling back your routine. It's definitely a matter of personal preference, but I reckon less is definitely more in this instance. If you haven't noticed the theme yet, it's minimalist. Whatever you can do without, don't bother with. If you will need to use the shower, a mini shampoo and conditioner will be needed. Otherwise a small can of hairspray and then some dry shampoo/texturising spray should do it. I would of course recommend having a couple of hair ties and hair clips in the bottom of your bag. It at least gives you some options each day in terms of hairstyles.